The use of Cyber-Physical Systems (CPS) will allow for monitoring and assessing the safety of temporary structures used on construction sites, according to research being completed in Penn State’s Department of Architectural Engineering. The National Science Foundation defines CPS as engineered systems that are built from, and depend on, the seamless integration of computational algorithms and physical components. The agency believes CPS will enable advancements in capability, adaptability, scalability, resiliency, safety, security and usability in embedded systems be being a driving force behind continued innovation and competition in industries such as agriculture, energy, transportation, building design, healthcare and manufacturing. While the implementation of CPS in the manufacturing, transportation and healthcare industries has occurred, its benefits to the construction industry are still being explored. A study completed by Xiao Yuan, an architectural engineering Ph.D. candidate, focuses on enhancing the monitoring of temporary structures through the use of CPS. The study investigates how linking sensors on the structures and virtual models can better ensure the safety of the more than 75 percent of construction workers who work on or around temporary structures, which may include sheeting and shoring, temporary bracing or guide rails, soil backfill, formwork systems, scaffolding, the underpinning of foundations, temporary or emergency shelters, public art projects, lateral earth retaining structures in construction zones, construction access barriers, temporary grandstands and bleachers, and indoor and outdoor theatrical stages. Improper construction and monitoring of these temporary structures remains one of the largest safety concerns on job sites. OSHA reports that of the 4,386 worker fatalities in private industry in the 2014 calendar year, 899 (20.5 percent) were in the construction industry. A significant amount of this percentage related to falls. Of the top ten most frequently cited OSHA standard violations in the 2015 fiscal year, construction fall protection and scaffolding general construction requirements ranked first and third, respectively. Though OSHA-required safety training programs, safety practices, and design, installation, maintenance and dismantling regulations have been put in place to address these alarming statistics, continued safety advancements are necessary. 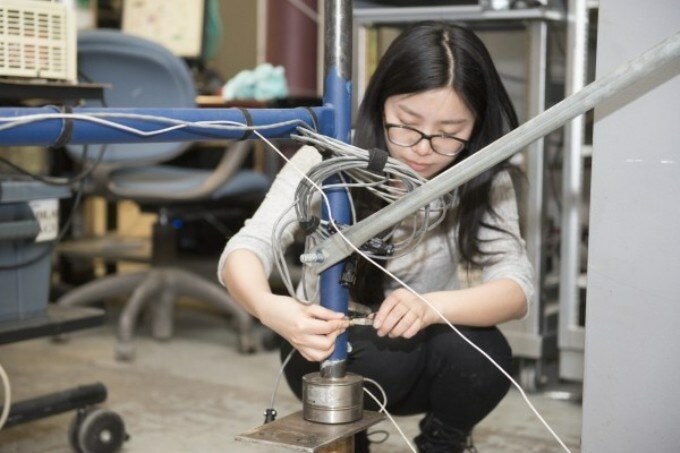 Yuan’s research investigates how CPS can be used to promote safer construction and prevent failures of temporary structures through virtual prototyping, data acquisition systems and communication networks. This setup allows for real-time inspections, remote interaction, early warnings of potential failures and immediate notification to workers through a mobile application available on the mobile platform. The bidirectional workflow of the CPS allows for sensors located on the temporary structures to collect and send data to LabVIEW, the selected data acquisition system, where information on the temporary structure is processed and sent on to the cloud database. Queries every two seconds monitor the structural performance based on predefined values. If no potential safety concern or failure is found, the system will continue to collect information from the sensor without any changes. If a potential failure is discovered during the CPS analysis, the potentially hazardous section will be highlighted in the 3D virtual model, indicating the need for further investigation. Warning notifications and detailed structural deficiencies are sent from the virtual model to the mobile devices used by on-site construction workers, safety inspectors and project managers. These industry professionals are able to use the virtually delivered information to address any potential problem – avoiding any structural failure and preventing any injuries or fatalities due to structural deficiencies. Five different failure scenarios were simulated in the architectural engineering labs in Engineering Units A on the University Park campus and include the base settlement of scaffolding system, overloading, a severe displacement of scaffolding planks, diagonal brace missing or not in the correct position and lateral load to the scaffolding system by wind or after being hit by a vehicle. Yuan said in addition to continuously monitoring the structures and detecting possible failures, the CPS research includes interpreting the system as an “intelligent” virtual model. The investigation is using machine learning technology to develop a self-learning model based on big data analysis. “The virtual model can learn from historical behavior for intelligent identification of potential hazards in the future,” she said. Now that the concept of the CPS temporary monitoring system has been proven, Yuan said the next step in the research project is to better determine job site costs and installation factors. Chimay Anumba, department head and professor of architectural engineering, and M. Kevin Parfitt, professor of architectural engineering, served as collaborators on the project.